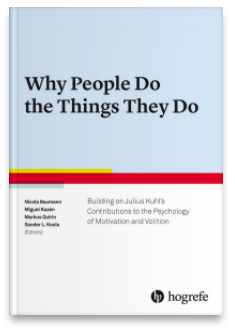 Buildung on the central contributions of Julius Kuhl like the PSI Theory leading researchers including Charles S. Carver and Richard M. Ryan reflect the implications for their own work. The first chapter can be dowloaded here. The book ISBN: 9780889375406 can be bought here. Citation: Baumann, N., Kazén, M., Quirin, M., & Koole, S. L. (Eds.). (2018). Why People Do the Things They Do. Göttingen: Hogrefe. Please find the table of content here.